Repair Your Relationships with Food, Body and Soul. I know that you'd love to eat the right things, at the right time in the right amounts but it just feels like your relationship with food is spiralling out of control and you're not sure how to get it back on track. I know that you don't want to go on a diet again but you're always eating like you don't know when you're gonna get fed again and you're in a 'binge-regret-hating yourself' cycle. You'd love to have a relaxed attitude to food but the stress of day to day life is keeping you stuck in the cycle, always looking for comfort in a packet of biscuits, bar of chocolate or family sized bag of Doritos. You want to feel good in your body but it feels heavy and lethargic; you're miserable and you hate it. You feel upset that you don't seem to be able to look after it properly and you just feel generally rubbish. You keep starting an exercise regime but you just don't seem to be able to stick to it and it just feels like you're stuck this way forever - or even worse, getting bigger and bigger. You know there's more to life and you want to have more fun but it just feels hard, like you're wading through treacle, stuck on a treadmill of stress, mental and emotional tiredness and overeating. You eat because your life is getting you down and your life is getting you down because you eat. Your eating feels completely out of control and you just don't know what to do about it. You’re looking for a way of making permanent changes, feeling better about every aspect of your life, feeling much more in alignment with YOU, and you want to take care of yourself, eat well and move more, without it becoming yet another chore. You’re looking for a new approach and you’ve just found it, here! I totally get it, you really want things to be different this time and you know there's more to life than endless dieting and being miserable. You know how to create healthy meals; you just don't seem to be able to stop bingeing on the foods you know aren't that great for you. You want to be kind to your body and to be able to look in the mirror and like what you see. But you're horrified at the idea that you're just getting bigger and bigger and you don't don't what to do about it. With all the stuff you've got going on right now, you just can't see how things can change but you're so ready for a new way! I know where you're coming from because I've been there; I’ve been that mum who hides in the pantry eating a whole box of Jaffa cakes when life got tough but I didn’t want my kids to know. I’ve been that girl who ate through an entire cheesecake when I’ve had bad news. I'm also a coach who has worked with women to stop them bingeing every time things got rough, who's helped women feel good enough and helped single mums eat better whilst including their kids in the cooking and reducing their shopping bills. I've helped working mums create time for exercise and self care, without dropping any of the balls they're currently juggling and I've helped women get out of the cycle of secretly eating the leftovers after everyone's left the kitchen. I've worked with women all over the world to support them in leaving food and body shame behind and creating a more fulfilled life. And over the past 8 years I've been featured in Families magazine, in the Yorkshire Evening Post and as a regular contributor on BBC radio. How does the Beautiful Swans Programme work? Additional resources in the library to support each module. The full signature programme is divided into 2 halves; the basic programme and a graduate programme. You can choose to purchase the basic part on its own at first and then add in the graduate programme at a later stage or you can save and purchase both halves now. Module 1 ~ In module 1 we'll start as we meant to go on. This module is all about tackling the causes of your emotional eating and giving it the boot! We'll use small but impact tweaks to start you off with a bang and say goodbye to emotional and binge eating. Module 2 ~ This module is all about your body. We'll be learning to appreciate the body you're in and looking at how we can include more exercise in a fun and non-punishing way. Module 3 ~ In this module we'll be looking at all the diet baggage you're carrying and learning how to get rid of it. We'll continue with the transformation of your relationship with food, revisiting emotional eating. In this module you'll learn how to feel more in control and get back to a 'normal' relationship with food. Module 1 ~ We'll start the graduate programme looking in more detail at food; we'll cover mindful eating, food planning and how food fits into self care. Module 2 ~ Next we'll look at how exercise fits into self care and we'll revisit your feelings around your body. We'll look at your clothing style, your body shape and we'll talk about colour and how you can use it to enhance the way you feel about your body. Module 3 ~ In a real 'mini' module we'll spend some time looking at how to make the best of your relationships and some techniques to enhance how you interact with other people in your life. Module 4 ~ Finally we'll introduce you to some great techniques for self growth and self preservation. And we'll look at how far you've come over the programme. This course isn't just 'self study', I'll be holding your hand every step of the way. Each week you'll have the opportunity to message me your insights and progress and you'll receive an audio recording with specific and personal mentoring. You will also have email access to me whenever you need it, so you can ask for help whenever things arise. This is more than an online programme, this is personal food and body coaching and mentoring. Beautiful Swans is my signature programme, designed to help you feel good about who you are and to leave emotional eating, dieting and body loathing in the past. It's everything I've learned over the past 8 years working with my one to one clients, laid out in a logical, straightforward way, so that each module builds on what went before. It's going to give you everything you need to change how you feel about your life, about your body and about food. I know it's gonna help you ~ I'd love to have you on board. "My mind and body are no longer battling each other"
I wasn't in a good place when I came to Beautiful Swans. I just hated myself and had a chaotic relationship with food. Having just completed the course, I am in a much better frame of mind and thanks to Rachel's guidance and support, I now have the tools I need to move forward and I feel as if my mind and body are no longer battling against each other. The program is not a quick fix but it's about taking some time to look inwards, to re-evaluate your relationship with food and yourself and it's whole ethos is something that you can take with you through life. Rachel has been in the same situation as many people that go to her and knew exactly where I was coming from. Her support and tools included on the program such as workbooks and journals were invaluable in helping me see where I needed to make changes. I will continue to use them to make sure I am keeping the momentum up. I see Beautiful Swans as one of the most important investments in myself that I have ever made. I'm learning to be a friend to myself and I am honestly so glad I did it. Thank you Rachel. "You have the power over food"
I took part in Rachel Swann’s Beautiful Swans programme in late 2015. The programme is highly experiential with common-sense tips and the content itself has a lovely rhythm and pace to it, gently stretching you out of your comfort zone. It is also a programme that you can use over and over again. Rachel has a gentle, easy way about her and inspires you to take confidence that you have the power over food, not vice-versa, and supports you to take positive steps to regain that control and balance. I would highly recommend Beautiful Swans AND Rachel’s skills to anyone who needed support in dealing with poor eating habits or patterns that need to be broken. Rachel has a huge number of practical techniques that are easy to remember and use and I have been hugely impressed by the results. 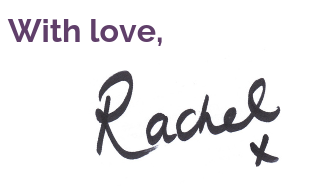 I have no hesitation in recommending Rachel's skills and can't praise her highly enough. I know you're probably having a few niggles about whether this is right for you. That's normal when you're embarking on something new. I want you to know that I'll take care of you every single step of the way, your success is important to me. Maybe you’re wondering if this will be just like all the times that went before, starting a new diet or exercise regime and just setting yourself up to fail. The beauty of the Beautiful Swans approach is that there is no failure and no wagon to fall off. We observe, we tweak, we test and then we do it all again to make things better and better and better. I will teach you how to carry on with everything you've learned and there's ongoing support if you need it - I won't leave you high and dry. Maybe you're worried about the 'online' aspect. You really don't need to be techy or to worry about it, I'm happy to help you if you're not sure how to access the groups or the classes and you can always let me know you need a bit of support. If it's security that concerns you, everything happens in a closed environment, no one will see anything you say and your weekly work will come to a secure email address for my eyes only. You're completely safe with me. Maybe you’re thinking it feels like it’s too time consuming. It’s around one hour a week, that’s one hour out of 168 hours in a week. You’ll have a 30 minute class with me and then around 30 minutes of filling in a worksheet, thinking and exploring to do and everything else fits into your daily life! If you don’t think you can spare yourself one hour a week – then you REALLY need to invest in this course! Perhaps the financial investment feels like a stretch. Of course it will; spending money on yourself can always feel scary but it will be so worth it, when you see how life changing it can be. Don't forget, you can pay over 10 months as well as in full, to make it easier to fit into your budget. Ask yourself what your happiness and health is worth? Who should Join Beautiful Swans? Do I need to be 'techy'? There are 2 technical aspects to the course. Firstly we'll use Facebook, a private group, where I'll run the live classes and give support and then messenger, which is how you'll send me info and how I'll respond with your personal mentoring. We'll also use Thinkific, which is a membership platform where I'll put additional resources for you to work with. All the info of how to access this will be given to you after payment. Both are easy to use but if you have any questions or problems you can always email me and I'll be happy to help you sort it out. You will have lifetime access to the course, so there is no 'behind'. I'll be helping you and cajoling you and one of the main parts of the course is creating more space in your life for you to do the things that matter to you. I will be prompting you each week for your work and of course it's best to do it as we go but I understand that life can get in the way. I did an older version of Beautiful Swans - can I upgrade? Each time I've run Beautiful Swans I've improved it and added more. The original content is still in the mix but I've increased and updated the information and added in much more personal and 1-2-1 stuff that although the name is the same, it's really not the same course. If you've already been through the course once, there will still be much more that you can benefit from within Beautiful Swans as it is now, so if you want to 'upgrade' you can send me a message, and we can work something out. Just click one of the yellow 'Join NOW!' buttons and you'll be taken to PayPal to pay securely. You can pay by credit or debit card or if you have a PayPal account you can use that. I don't see your card details and PayPal is a really secure way to pay. Just hop over to the Get In Touch page and use the form to send me your question. I'll be in touch ASAP! You're here for a reason; you know that you need the help, now is the time to decide to put yourself first and really get control of your relationship with food, and taking care of your body. Make that first step today towards feeling more at peace with yourself which, in turn, will impact and improve everyone else's lives around you. I'd love to help you to make that change! After years of over eating and a poor body image, Rachel helped me to realise that my core issue was my inability to trust my body's natural hunger signals. I've since learnt to tune into both my hunger and satisfaction levels, and also to listen to what my body is telling me to eat. I now enjoy my meals and I leave the table feeling good instead of bloated and unhappy. Rachel also taught me that one of the main reasons I struggled with my weight was my inability to put my needs before any one else's; so not making time for a walk or taking a proper lunch break . Rachel helped me to realise that taking care of ME was very important and it would lead to me being better able to take care of my family. I really enjoyed working with Rachel. Her approach is authentic and practical but also inspirational. Having struggled with being over weight herself, she really understands what it feels like to be unhappy with your body and I found it so inspiring that she did many of things she encouraged me to do! She is a great role model. I would recommend Rachel to anyone who is suffering alone with poor body image or a lack of confidence. She will show you a better way to live, which will ultimately lead to a happier outlook on your life. I’d like to say a big thank-you to sweet Rachel Swann. I purchased Rachel’s Beautiful Swans programme and although I’m pretty slow in the process, it’s already proving useful. At the start I asked a lot of questions because I wasn’t sure if Rachel’s service was right for me. She was patient and really responsive and reassuring. I thought I knew myself pretty well and what my issues were but by working with Rachel I found that things I thought were insignificant were having a huge impact on my life. My first goal was to lose my emotional relationship with food and end my constant battle with food and I have really moved forward on that. I really appreciated the coaching aspect and not just the hypnotherapy and I really value that.